Under the patronage of H.E. Minister of Labor and Social Development Eng. 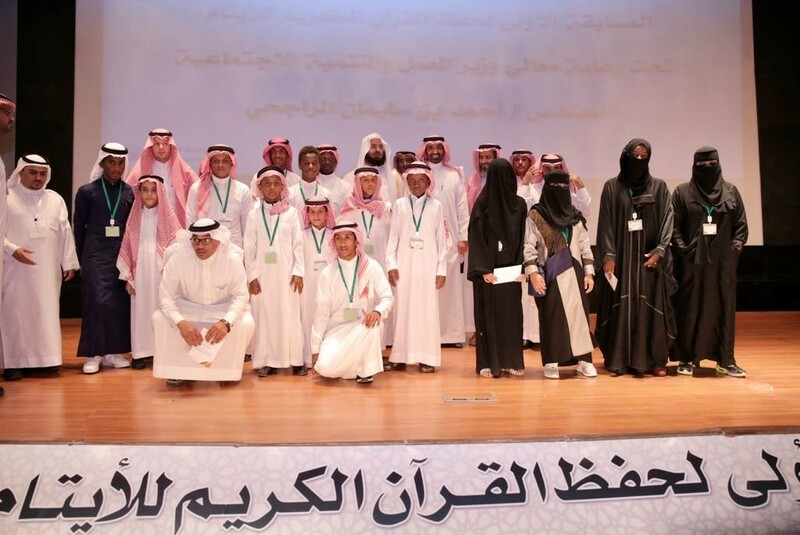 Ahmed bin Suleiman al-Rajhi, the General Administration for Orphans’ Programs and Activities organized on Wednesday the closing ceremony for the 1st Holy Qur’an Competition, held at MLSD- affiliated Al-Diriaya Complex in Riyadh. The ceremony was initiated by reciting some of the verses of the Holy Qur’an after the attendants viewed a presentation on the competition, and then the winners delivered their speech thanking the ministry for conducting such a contest and allowing them to memorize the Quran with understanding and contemplation and compete with one another. The contestants also extended their thanks to the minister of labor and social development for his patronizing the ceremony as the participants marched forward before those who attended the event. H.E. Eng. al-Rajhi stressed in his speech the importance of conducting the competition and urged officials to continue their efforts in developing and expanding the benefits of such events, hailing those who took part in the success of the 1st Holy Qur’an Competition that target this beloved category of daughters and sons. At the end of his speech, H.E. Eng. al-Rajhi thanked the ‘Maknoon’ Society for the Holy Qur’an Memorization for participating in the contest’s arbitration as well as Abdul Mohsen Al-Hokair Group for sponsoring the closing ceremony. At the ceremony, the male and female contestants were honored and awarded prizes by the sponsor. The ministry aims through this contest to motivate orphans of MLSd-affliiated shelter houses to memorize the Holy Quran with understanding and contemplation and to spread a sense of competition among them with helping them to spend quality time. Meanwhile, the competition was held at three stages by memorizing certain parts of the Holy Quran’s verses with participation of 80 male and female orphans who currently stay in hospitality houses, education entities and shelter houses affiliated to charitable entries and foundations in various regions of the Kingdom.